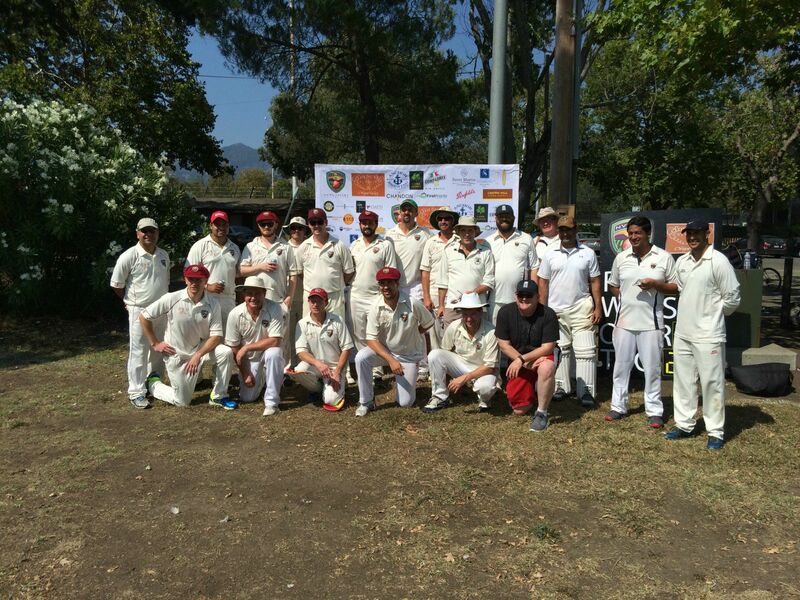 The Napa Valley Cricket Club (NVCC) turned around a three game losing streak in their second game of 2015 against local rivals Marin CC in Calistoga recently. 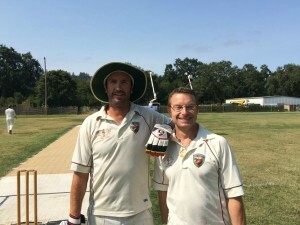 A pair of centuries from batsmen Martin Mackenzie (102 not out retired) and John Leake (133 not out retired) set the NVCC up for a big score of 297 in their 35 overs which ultimately proved to much for Marin to chase. NVCC Club Captain Rob Bolch lost the all-important toss and was asked to bat by Marin captain Vish Chapman. With a strong batting line up Bolch was happy to oblige and sent out New Zealanders Mackenzie and Jeff Keene to see off the new ball. The pair did their job well until Keene fell in the 10th over to a leading edge for seven runs. Shortly after that the NVCC number three batsman Kiranpreet Singh fell for two runs, again to a leading edge. While Marin sensed that they had NVCC on the back foot Leake had other ideas and with Mackenzie saw NVCC to the drinks break with a total of only 62 runs on the board. Knowing that NVCC needed to accelerate the run rate Leake and Mackenzie duly obliged and in the next 14 overs the pair pummelled the Marin bowling attack, sharing a third wicket partnership of 244 runs. Leake amassed a total of 21 boundaries – 12 fours and 9 sixes – while Mackenzie struck 10 boundaries – five each fours and sixes. The pair both retired in the 33rd over after Mackenzie had achieved his first century for NVCC, in fact his first ever “ton” in all the time that he has played cricket. Leake on the other hand has scored a century in each of the games that he has played for NVCC this year. Birthday boy Andrew Healy (8 not out) and Tim Irwin (10 not out) closed out the batting for NVCC after the simultaneous retirements but couldn’t quite push NVCC over the 300 runs mark. On a day of records at The Fairgrounds Marin would have created their own if they had chased down the total. It wasn’t to be for them as NVCC took regular wickets that were spread amongst the team. Bolch used nine different bowlers showing that NVCC had depth in the bowling department in addition to firepower in the batting department. Two early wickets for Bernie Peacock and some pin-point bowling from Patrick O’Neil had Marin tied down and they continued to ship wickets as Bolch built the pressure by rotating his bowlers and not allowing the Marin batsmen to settle. The most patient batting performance from Marin came from Sunil who faced 24 balls before he got off the mark. Sunil eventually went on to anchor the Marin innings with a total of 89 runs and once set he took a liking to everything Bolch had to throw at him from the pace of Irwin, the turn of Peacock to the accurate medium pace of Tim Kay. A quick fire 15 off five balls from Marin captain Chapman added some respectability to the final scoreboard as Marin ended up with 173 runs off their 35 overs. 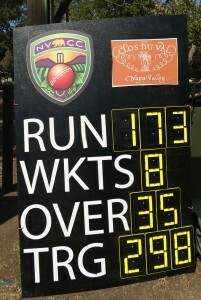 The NVCC bowlers shared the spoils with Singh posting the best figures of 2 wickets for only 13 runs off his 6 overs. Peacock (2 for 20 off 5) , Kay (2 for 26 off 4), O’Neil (1 for 5 off 5) and Bolch (1 for 19 off 4) were well supported by their fielders with Hardeep Thakar in particular having a strong day in the field with two catches. 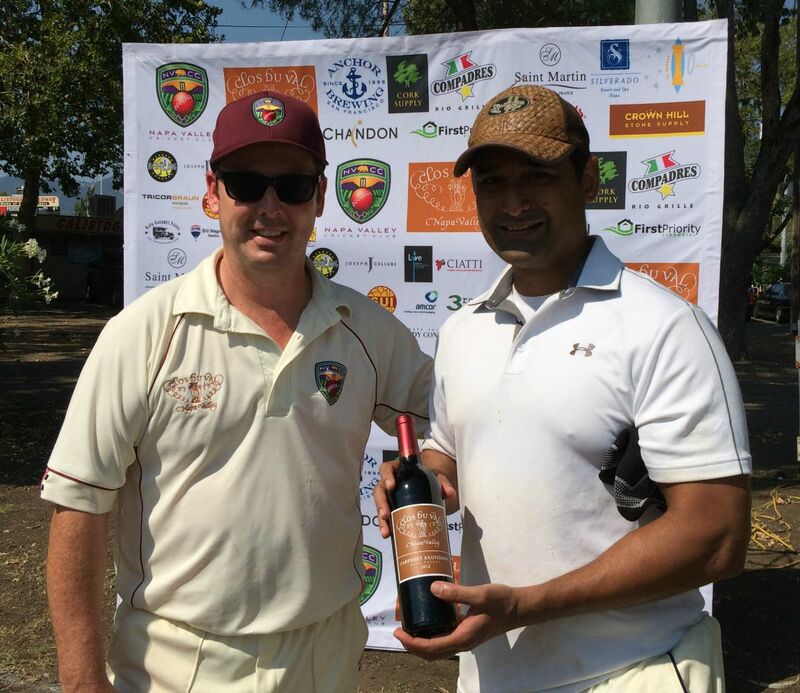 After the match, NVCC Club Captain Rob Bolch presented the Clos du Val Man of the Match award to Marin’s Sunil for his contribution to the game with the bat. Napa Valley CC Batting – John Leake 133 runs (retired) off 71 balls (12 x 4, 9 x 6), Martin Mackenzie 102 (retired) off 85 (5 x 4, 5 x 6), Tim Irwin 10 off 6 (1 x 6). 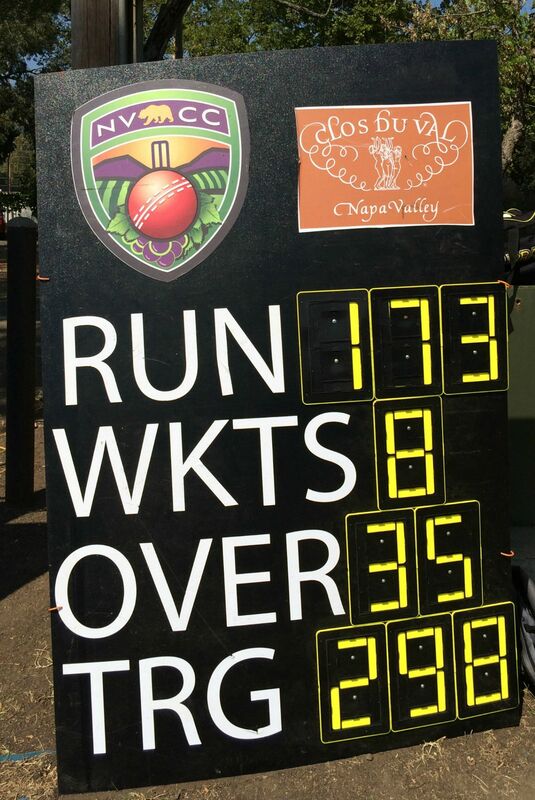 Napa Valley CC Bowling – Kiranpreet Singh 2 wickets for 13 runs off 6 overs including 1 maiden, Bernie Peacock 2 for 20 off 5 including 2, Tim Kay 2 for 26 off 4, Patrick O’Neil 0 for 5 off 5 including 2.